The 7 ‘P’s, “Prior Preparation & Planning Prevent Piss Poor Performance”, were drummed into us all in the army and, yes, I accept that in most situations they do indeed have their place. Sometimes though, you’ve just got to go with what you have. We’ve got our flights now, which commit us to leaving, whether ready or not, in less than a month. It doesn’t leave us much time, on top of everything else that’s going on, to find sponsorship for the things we need to take but can’t afford to buy, which is mainly the audio and video recording kit. It feels great to have committed ourselves though. Bruce Parry and I did this in October 1999 at the outset of planning the ‘Cannibals & Crampons’ expedition. It blew virtually every penny we had and gave us only six weeks to find everything else we needed for free, but as an action galvaniser it was a first class opening gambit. This time we would have also bought flights at the 6 week point but we wanted to hear first from Ali, our contact in Kashgar, on a few questions I put to him about permits and potential ‘no-go’ areas. Xinjiang is one of the most ethnically turbulent provinces of China and there will be enormous areas that are sensitive for one reason or another, crawling with military checkpoints, etc., etc. He and others, however, are not being terribly helpful so we’re just going to get there and figure it out on the ground. Maybe we’ll still be forced to rethink our expedition area but in the meantime, nothing need stop me getting on with sourcing kit. On this front I’m still persuading myself that we can get by without spending money on ‘outdoor’ gear. What’s that picture doing there? Why, it’s an example of getting by perfectly well with kit that might erroneously be considered substandard. This one is more relevant perhaps. 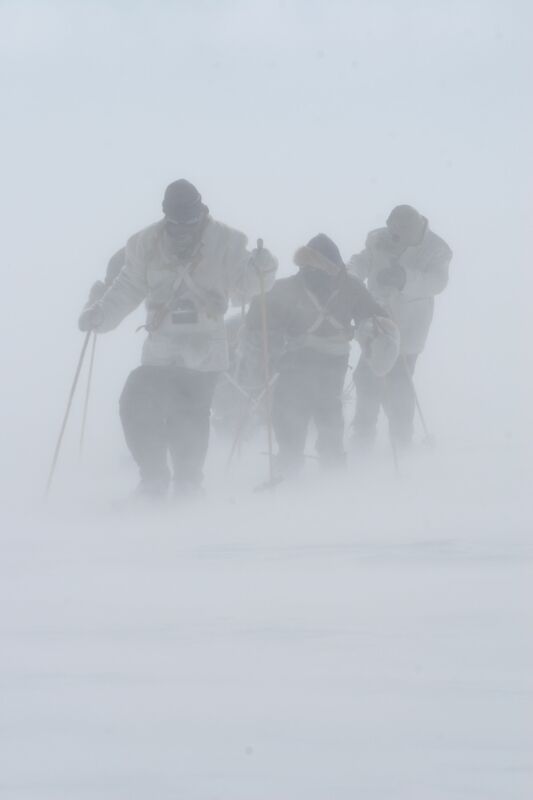 The wind on this day in Greenland was strong enough, at one point, to blow over our sledge weighing several hundred kilos and we battled through it for just over 10 hours. That’s me in front, Bruce Parry behind, then Chris Van Tulleken and Rory O’Connor. I am wearing a sort of sports jacket made out of a woollen blanket, over a wind smock and over trousers of gaberdine, over an assortment of woollen jumpers and long johns. While the others are wearing their reindeer skin mitts I have opted to use mine as shock absorbers on the harness and am wearing my ancient, brilliant and much-patched dachstein felted woollen mitts. To protect our noses from frostbite we had each cobbled together our own personal face merkin. Mine was made from a patch of sheepskin. Chris’s appeared to have been cut from an arctic fox’s scrotum. My point? Well, while many of the explorers who set out in this sort of clobber did, it’s true, never come back, their untimely deaths can usually be put down to factors other than the clothing they wore. I think we’ll get by and that’s enough on the subject. You are enering the world of yin and yang. Yang prepares for every eventuality, thus controllling the experience. Yin lets the experience take you, and thus minimizes preparation. Balance, and harmony, in all things!